Okotie says Trump Victory will be USA's step towards rapprochement with God. What the hell is Pastor Chris Okotie talking about?He says a Trump victory will be the first step towards a national reconciliation and rapprochement with God.What nonsense! 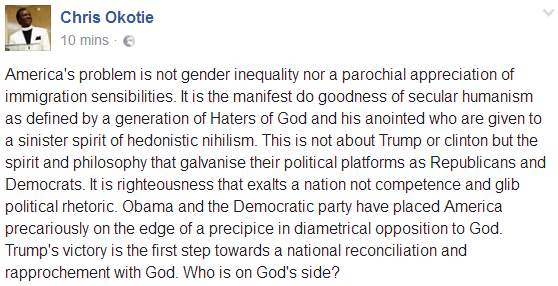 What the hell is Godly about Trump?Or Okotie himself come to think of it?I have always said religion or those who think they are so holy are the biggest problems of the world.Chris Okotie has just proven this once again with this nonsense talk.See the full posting of Okotie's thought below.